The Alta Mesa Memorial Park in Palo Alto is where Steve Jobs was buried on October 7, 2011, days after losing his battle with pancreatic cancer. For many, their legacies are often buried along with their remains. Not Steve Jobs. 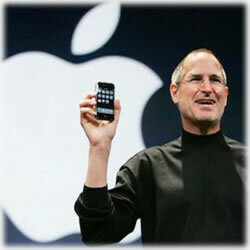 This week, we take a look at the man behind the apple, as the world continues its shared mourning period. Although many of our hearts are still heavy, we are planning a celebration of his life for Apple employees to take time to remember the incredible things Steve achieved in his life and the many ways he made our world a better place. Indeed, his contributions and ability to see the needs of a future generations propelled him into legacy status. From the nifty advances in credit card technology that we write about here on this blog to the contributions to the business, music and technology sectors, Steve Jobs had what many can only hope to achieve in ten lifetimes: a fearless approach, refusal to accept less than perfect results an a respect for his fellow humans. He expected the best from himself, so it stood to reason he would expect the best from those around him. Alongside the Discovery Network crew, a documentary will air on October 16. iGenius: How Steve Jobs Changed the World is a celebration of a life well-lived. It will feature interviews with those who knew him best at every stage of his life. It will also feature many celebrities and musicians who, according to Reuters, “will weight on on Jobs’ impact throughout the entertainment field”. Many believe his incredibly emotional and heartfelt commencement address delivered to the Stanford University Class of 2005 will be what opens the documentary. It’s poignant, confident and a testament to his collective life, contribution and ultimately, his faith. It will also have a small segment on the disease that eventually claimed his life, too. There was no autopsy performed, though the coroner noted the cause of death as respiratory arrest caused by metastatic pancreas neuroendocrine tumor. As many of employees have said, “He fought the good fight”. Initially, that 2003 diagnosis also brought a life expectancy of only a few months, though Jobs, true to his fighting spirit, fought back. He incorporated traditional modern medicine into several alternative treatments which led him to believe he’d beaten the disease, and thus, the imminent death he was facing at one point. There were the expected relapses and bad reports, but ultimately, he was sure he was in a permanent remission state. Now, the world is left with that incredible commencement speech, their iPhones, iPads, iPods and iMacs though soon, they will also receive, courtesy of the company he built and the Discovery Channel, iGenius. Now’s the time to set your DVRs. As mentioned, it airs on October 16th at 8 p.m. Eastern time and again at 1 a.m. Eastern time on October 17th. This is one documentary every person on this planet will be able to relate to.